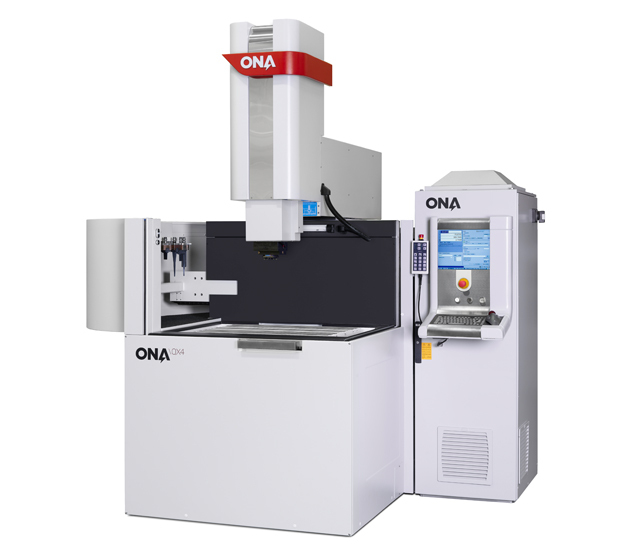 ONA, world leader in large and customized EDM machines, will present the new range of ONA QX series machines as the principal new product at the BIEMH exhibition. These machines increase productivity, surface quality and EDM machining precision to hitherto unseen levels. QX series machines include a new 100% digital generator that provides great benefits to users of this technology. Especially significant is the increase in productivity in finishing operations where an average 60% improvement is achieved both with copper and graphite electrodes, as well as major improvement in the homogeneity of the roughness on large surfaces. In the mould sector, in which the machining of deep and narrow grooves with very difficult cleaning conditions is very common, there has been up to a 50% increase in productivity in this type of work, without any increase in electrode wear. The increase in productivity of QX machines is linked to a significant reduction in electrode wear, which can be up to 500% depending on the type of application. This advantage allows significant cost savings and simplifies the performance of many jobs where previously it was necessary to use two electrodes but for which one is now sufficient. This significant reduction in electrode wear enables QX machines to obtain cavities with a high aspect ratio, as well as to substantially improve the precision in micro-cavities, ensuring operations of up to 5 microns in the inner radius of corners, compared to the 15 microns of previous generation machines. The new 100% digital generator offers unprecedented flexibility to adapt the technology to the special and specific applications of each customer. The generator has been developed bearing in mind the demanding quality requirements of the aviation and aerospace sector, in which advanced materials of exceptional hardness, such as nickel and titanium-based alloys, are used. The minimum final roughness that the generator can obtain is just 0.08 µm Ra. The new family of ONA QX machines will be represented at BIEHM with the ONA QX4 model, which features travel of the x-y-z axes of 600 x 400 x 400 mm, as well as the large model, ONA QX8 MODULAR. QX MODULAR machines have a modular and versatile design that allows each customer to configure their own machine with great flexibility, choosing from 40 different standard configurations. The largest model in the QX MODULAR series is the QX10 machine, which features x-y-z travel of 3000 x 1500 x 1000 mm and permits the loading of pieces of up to 25 tons. The smallest model in the QX MODULAR series is the QX7 machine, which features x-y-z travel of 1500 x 750 x 650 mm and permits the loading of pieces of up to 15 tons. All machines in the QX MODULAR series may also have up to two heads controlled by separate CNCs, with it being possible to independently machine two cavities at the same time on one large piece. Finally, it should be noted that ONA QX series machines have a powerful CNC that can control up to 8 axes simultaneously, and which features an open architecture, aligned with Industry 4.0, enabling full integration of the machine into the customer's management and control environment.